Studio Loja Saarinen, under the direction of Loja Saarinen, frequently collaborated with Eliel Saarinen to translate his designs into fiber. 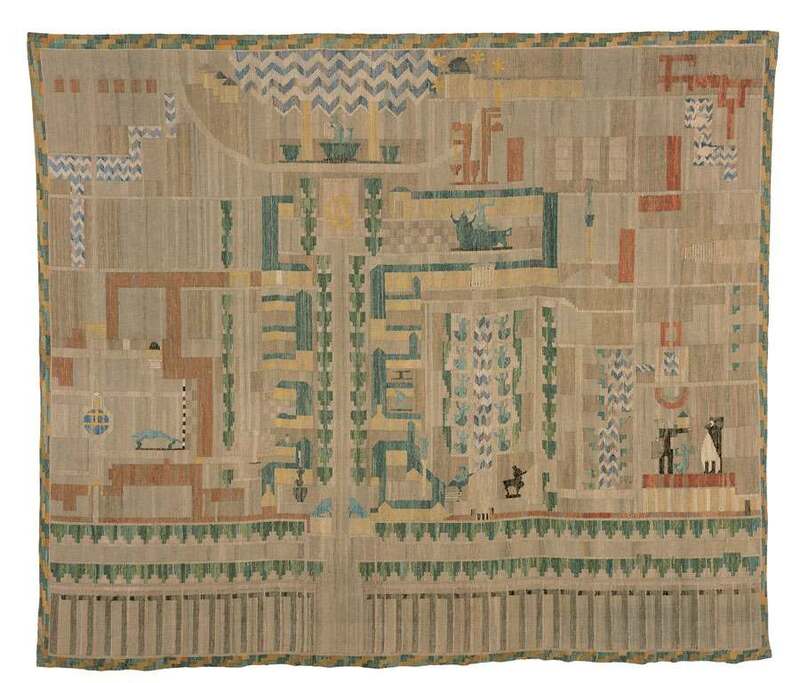 This large-scale Cranbrook Map Tapestry was designed by Eliel and is based on one of his proposed plans for Cranbrook. It includes Cranbrook Academy of Art and the Art Museum, Cranbrook School for boys, Cranbrook Institute of Science, Kingswood School Cranbrook, and the Cranbrook Pavilion and Greek Theatre. The buildings, sculpture and landscaping in this lively schema ignore all rules of perspective and scale. Buildings are presented in plan, elevation or from a bird’s-eye view. Natural elements such as bodies of water and trees are geometrically stylized. The sculptures, mostly by Carl Milles, take on enormous proportions as do the two fanciful figures at the bottom right, possibly Eliel as the architect and painter sending a clever message to patron George Booth that his proposed expanded Institute of Science, represented by the penguin, should be located at Eliel’s preferred location, the site of the Cranbrook Pavilion depicted just below the figures. Not surprisingly, Booth won the debate and the existing Institute was expanded in its current location.